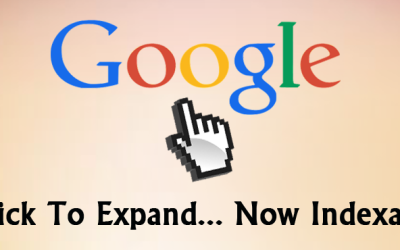 When it comes to bring in the best for users, undoubtedly Google comes to forefront with new features being added to its search results frequently. 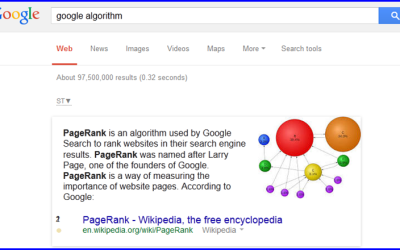 The last big leap was of course RankBrain wherein Google had introduced AI in its search algorithm. Though people have different opinions on its efficacy but Google has always supported the move saying it has eliminated a lot of burden. We had covered earlier that Google was showing weird knowledge graph for Sundar Pichai & Amit Singhal. And this is happening again. While searching for “Google CEO in 2014”, knowledge panel is showing Larry Page but surprisingly image of Sundar Pichai is there. Also the data Google is drawing from Wikipedia’s Sundar Pichai page. Thereafter, I tried to check results for Google CEO for other years as well to analyse how Google is extracting data for knowledge panel. It is again showing different results for the same entity. For search query “Google CEO Now”, it’s showing Sundar Pichai & drawing data from Wikipedia whereas for query “Google CEO in 2017”, even if it’s showing Sundar Pichai but drawing data from business Insider blog post. Interestingly, for search query “Google CEO in 2016” & “Google CEO in 2015”, knowledge panel is showing “Pichai”, not “Sundar Pichai”. In both cases, Google extracting data from Wikipedia’s Sundar Pichai page with entity name same but with different descriptions. For search query “Google CEO in 2013”, it’s showing Larry Page but still drawing data from Wikipedia’s Sundar Pichai page. For search query “Google CEO in 2011” & “Google CEO in 2010”, it’s showing “Schmidt” and “Eric Schmidt”, drawing data from 2 different sources. Well, there are two issues here that don’t make sense; showing Pichai in place of Sundar Pichai and Schmidt in place of Eric Schmidt. 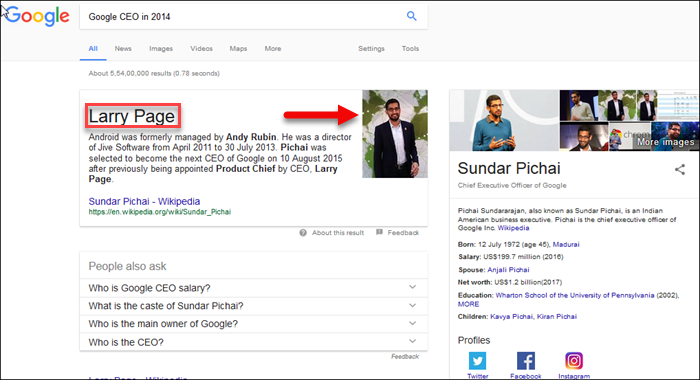 And the 2nd one is showing Larry Page with data from Sundar Pichai Wikipedia page but also with Sundar Pichai image. It is clear that google is extracting data from Wikipedia page of Sundar Pichai. The search query consists of two main terms; Google CEO and time. As there is no clear or direct answer anywhere and even in that page, so Google is trying to figure out and combine individual data (name for CEO & time) from relevant sentence. You can see that in each of above screenshots, the answers are different sentences of the page consisting of the term CEO, time and whatever name appear in that sentence is appeared in the answer box. I think that is the reason, some search queries show result as “Pichai” rather than full name as those sentences have only “Pichai” in them. And the image is a plain mistake as Google is considering the Sundar Pichai page as the prime source of information for the query and shows the image even if showing the correct answer as Larry Page.